(Nanowerk News) Nanoparticles of gold can act as tiny, precise and powerful heaters, which potentially could be used in biomedical applications, according to a new study. The heating properties were observed in ice, water and a polymer shell that was designed to mimic material in biological systems. 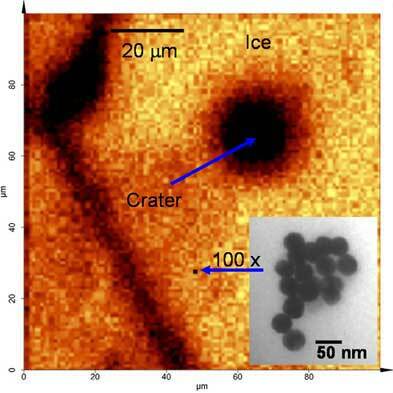 Though the ice did not melt when heated by low-intensity laser alone, it dissolved once a gold nanoparticle was embedded, said the scientists, whose findings have been published online by the journal Nano Letters. The gold particle is 50 nanometers, which is 200,000 times smaller than an object 1 centimeter in size, Govorov said. "What’s amazing is that we’re taking particles that you can’t even image with a light microscope, and all of the sudden they cause a huge change in a macroscopic system," said Richardson, whose project was funded by Ohio University’s NanoBioTechnology Initiative, one of three major research priorities of the institution. Richardson is a professor of chemistry and Govorov is an associate professor of theoretical physics at Ohio University. Other collaborators in the project include Zachary Hickman, Alyssa Thomas, Wei Zhang and Martin Kordesch, all of Ohio University.